Once the legalization of marijuana spread across the country, so did the popularity of THC oil cartridges for vape batteries and pens. THC vape carts make it easier than ever to enjoy cannabis with both convenience and discretion, whether you’re on the go, enjoying a romantic Valentine’s Day date with your stoner bae, or just chilling at home. Blueberry Dream is a sativa hybrid with a long-lasting, creative cerebral high. Originally created by Snoop Dogg’s brand, Leafs by Snoop, this strain has proprietary genetics that are kept secret. What is well-known, though, is that Blue Dream has a flavor and high that’s potent enough to give Blue Dream a run for its money. The THC content of these Hellavated CO2 cartridge is 87% and the CBD is measured at 0.86%. This THC vape cart has a juicy blueberry flavor and aroma that gives pure berry sweetness upon exhalation, just as the effects of this sativa leaning hybrid start to take effect. If you need to remain focused and energetic, yet still relaxed and calm, this Blueberry Dream is the perfect choice. This tropical mango-flavored CO2 cartridge by Hellavated was made from a potent hybrid blend that offers focused, uplifting, and thought-provoking cerebral effects balanced with mental and physical relaxation. Invigoratingly minty in both aroma and flavor, this Hellavated OG Mint CO2 vape cartridge is the perfect way to get a discreet, mess-free, pick-me-up throughout your day. A creative strain, OG Mint will get those imaginative juices flowing and offer some serene introspection. Full of juicy, tropical pineapple flavor and aroma, the Hellavated Pineapple Kush CO2 THC vape cartridge offers a purely cerebral experience. Take a couple of hits, and you’ll be enjoying some thought-provoking and reflective effects. Got a creative project to work on? This is the THC vape cart you need. Chocolate-dipped strawberries may be romantic, but they’re also pretty messy. This Strawberry Haze THC vape cartridge from Hellavated? Not at all. Sweet, juicy flavors and aromas of strawberries come through on the exhale of each hit, lingering on the tongue for just a moment longer. A true hybrid, this one is perfect for a relaxing, cozy date night with your stoner bae. Just puff puff pass this back and forth, and let the deep conversation flow. Save some time when shopping for these Hellavated THC vape cartridges by ordering through our online menu and then picking them up in the store! 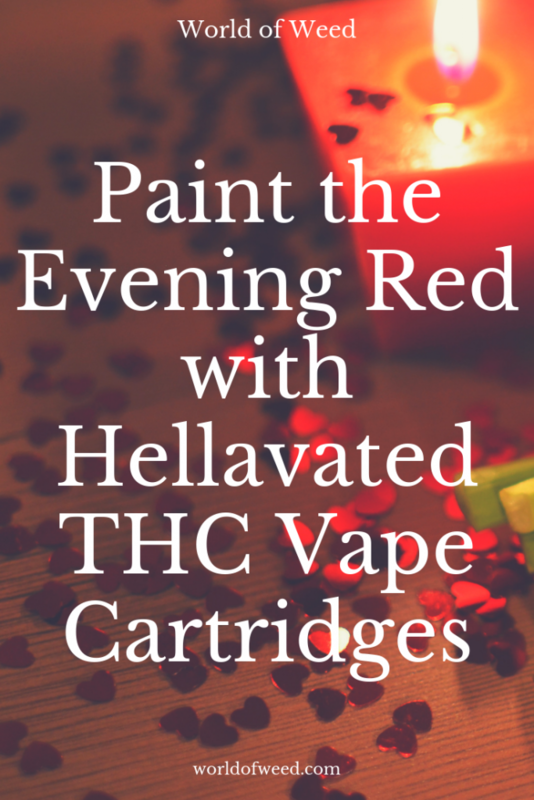 The post Paint the Evening Red With Hellavated THC Vape Cartridges appeared first on World Of Weed. Next articleCan Marijuana Cause Weight Gain?